He came to Minnesota in 1885. He was a member of the Phi Beta Kappa fraternity and the Skull and Bones secret society at Yale University. 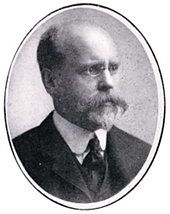 He was one of the organizers of the St. Paul College of Law in 1900. Tighe, Ambrose. The Development of the Roman Constitution. New York: American Book Company, 1886.